I have had a mad mind for Lemon Tart lately, I think it is the good weather. I want to sit outside with a crisp white wine and a slice of nicely sharp but creamy lemon tart. I don’t often make deserts, it tends to be only when we have guests but I was heading over to dinner in a house with a beautiful old garden, full of flowers and home grown vegetables and this seemed like the perfect desert to bring to enjoy outside on a beautiful summer evening. Instead of using my regular shortcrust pastry I wanted to try something else. I wanted a rich pastry, like a Pate Sucre but that would work, GF, I wanted something almost biscuity. I decided to experiment and I came up with this recipe. The pastry worked really well, it was tender and crisp and was a lovely counterpoint to the silky sharp lemon filling. The filling is from Antony Bourdain’s Lemon Tart from the Less Halles cook book, this filling is simple, delicious and I have used it many times and it has always been gorgeous. I made this in an 11″ fluted loose bottom tin. But the filling is actually for a 10 ” tart shell. 3. Add enough of the beaten egg to bring the pastry together to a smooth ball. 5. While the pastry is chilling preheat your oven to Gas 5 and butter your tart tin. 6. After 30 minutes remove the pastry from the fridge and either roll it out between two sheets of grease proof paper or press the pastry with your hands in to your buttered tin, this is quite a soft pastry so it may be easier to press the pastry in to the tin with your hands. 7. Cover the pastry shell with greaseproof paper and fill with baking beans and place in your preheated oven for 15 minutes. 8. Carefully take the tin from the oven, with even more care remove the greaseproof paper with the baking beans, take your time, you don’t want to pull out a piece of cooked dough. 9. Brush the pastry shell with beaten egg and return to the oven to dry out for a further five minutes. 10. Remove the shell from the oven and reduce the temperature to Gas 3. 1. Whisk together the lemon juice and sugar until well combined. I use a hand whisk for all of this, there is really no need for an electric mixer. 2. Add the eggs and whisking thoroughly. 3. Whisk in the double cream. 4. Pour the filling in to the pre baked tart shell and return to the oven. 5. Bake at Gas 3 for 25 minutes until the custard is set. I find it much easier to put the tart shell on your oven shelf and then our in the filling so you don’t have to try and transport the shell filled with a very liquid custard. 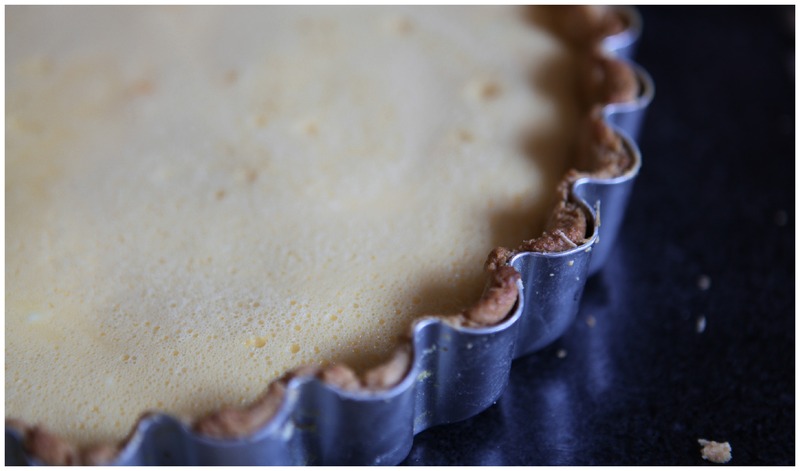 Leave the tart to cool before removing the tart from the loose bottomed tin. Serve this with whipped cream, sweetened if you like. Find an appropriately sunny spot, pour a glass of wine and enjoy! Yum! This is fantastic looking! And it tastes as good as it looks! Let us know if you try it out – would be interested to hear what you thought of it!